Perpiacere is a restaurant and wine bar located at the "corner of Maturana and Catedral" in the Barrio Brasil neighborhood of Santiago, Chile. The direct translation of the restaurant's flyer reads: "A restaurant designed for pleasure. The best tapas, pastas, meats, fresh seafood and select wines. Good music and hip people. Come have fun and enjoy! " This picture was sent in by Chileno. He writes: " This might be interesting too: Chile is the world's largest copper exporter, supplying the 1/3 of the total production. Copper counts for 47% of the state's revenue. 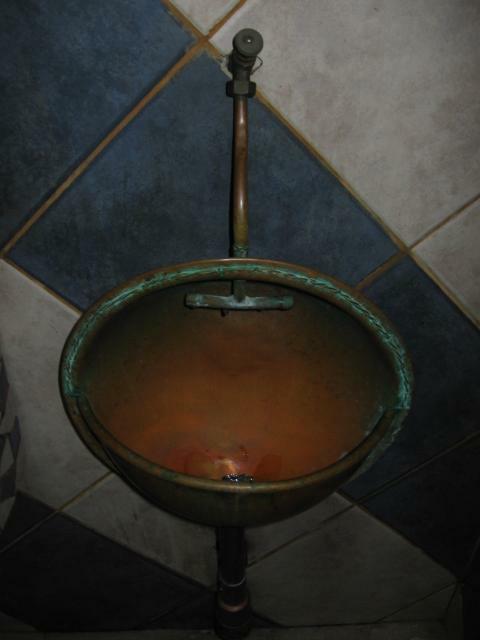 This urinal is made out of copper, and was hand crafted by local gypsies. The restaurant is located in Barrio Brasil, a pretty hip place to hang out with lots of beautiful old buildings that are under threat of being demolished by Santiago's unregulated construction conglomerates, and replaced by cinderblock highrises with bad plumbing ".